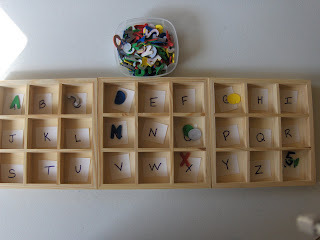 This alphabet sorting activity is great for working on identifying letters and putting them in alphabetical order. It is really inexpensive to put together. I used foam letter stickers from the Target dollar spot (any letter sticker or letter magnet would work) and the three trays are actually shelves found at the Dollar Tree. 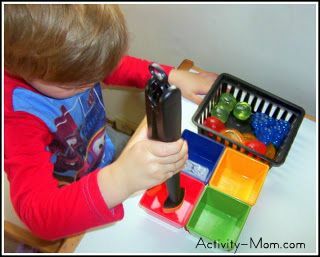 The idea to use the shelves/trays is from Shafer Family Blog (an incredible blog). She came up with this idea and since then I’ve seen them used on so many different blogs. Ohhhhhh, I love all the different uses for them! I’ll definitely try these out with Maddie. And, thank you for the sweet shout-out! YOU run an amazing blog!! In fact, I was going to let you know that I cut all my foam letter animals for Maddie yesterday (well, not ALL are animals and we did lower case) because you inspired me! i love the shafer family blog, too! and i’ve so been wanting to make something like this, but was too lazy to think of multipurposes for buying the shelves. great ideas! Now that we are starting to learn the alphabet I am definitely going to make one of these up. I think they are a fabulous resource to have and like you said, they are so versatile as you can use them for lots of different purposes. 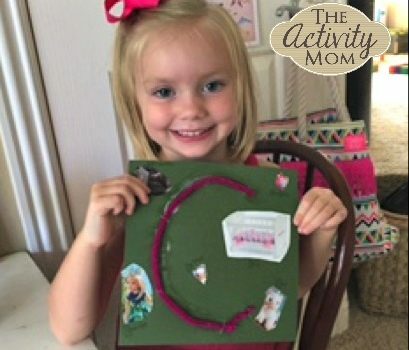 I’ll be doing this with my daughter, great idea!